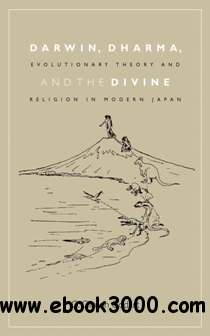 Darwin, Dharma, and the Divine is the first book in English on the history of evolutionary theory in Japan. Bringing to life more than a century of ideas, G. Clinton Godart examines how and why Japanese intellectuals, religious thinkers of different faiths, philosophers, biologists, journalists, activists, and ideologues engaged with evolutionary theory and religion. How did Japanese religiously think about evolution? What were their main concerns? Did they reject evolution on religious grounds, or-as was more often the case-how did they combine evolutionary theory with their religious beliefs? Evolutionary theory was controversial and never passively accepted in Japan: It took a hundred years of appropriating, translating, thinking, and debating to reconsider the natural world and the relation between nature, science, and the sacred in light of evolutionary theory. Since its introduction in the nineteenth century, Japanese intellectuals-including Buddhist, Shinto, Confucian, and Christian thinkers-in their own ways and often with opposing agendas, struggled to formulate a meaningful worldview after Darwin. In the decades that followed, as the Japanese redefined their relation to nature and built a modern nation-state, the debates on evolutionary theory intensified and state ideologues grew increasingly hostile toward its principles. Throughout the religious reception of evolution was dominated by a long-held fear of the idea of nature and society as cold and materialist, governed by the mindless "struggle for survival." This aversion endeavored many religious thinkers, philosophers, and biologists to find goodness and the divine within nature and evolution. It was this drive, argues Godart, that shaped much of Japan's modern intellectual history and changed Japanese understandings of nature, society, and the sacred. Darwin, Dharma, and the Divine will contribute significantly to two of the most debated topics in the history of evolutionary theory: religion and the political legacy of evolution. It will, therefore, appeal to the broad audience interested in Darwin studies as well as students and scholars of Japanese intellectual history, religion, and philosophy. Evangelical Feminism: A New Path to Liberalism?